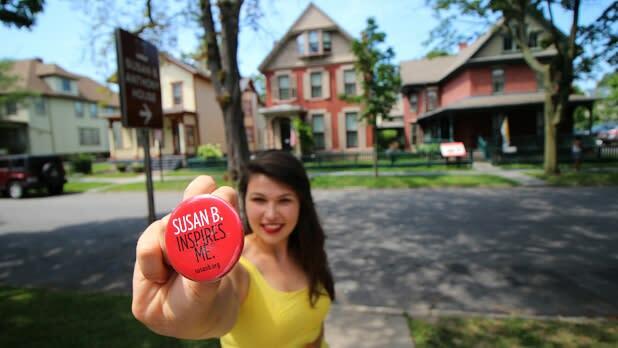 Many people know Susan B. Anthony as the woman on the dollar coin who was arrested for voting, but there is so much more to know about this phenomenal woman. 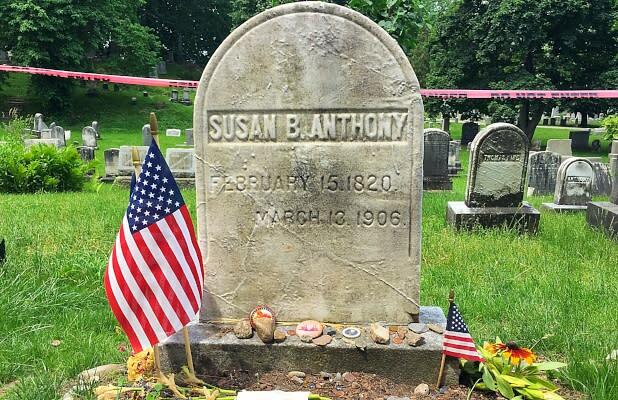 Not only was Susan B. Anthony a leader in the women’s suffrage movement, she also fought for women’s rights in education, marriage, the workplace, as well as for the abolition of slavery. Anthony was born in 1820 and spent her childhood in Battenville, New York. She grew up during a time when women were not full citizens of the United States. Women essentially had no rights and were considered the property of their husbands (or fathers, if not married). Women were unable to vote, could not own property, were not allowed to initiate a divorce, lost custody of their children if their husbands left them and did not have any advanced educational opportunities because colleges and universities did not accept female students. 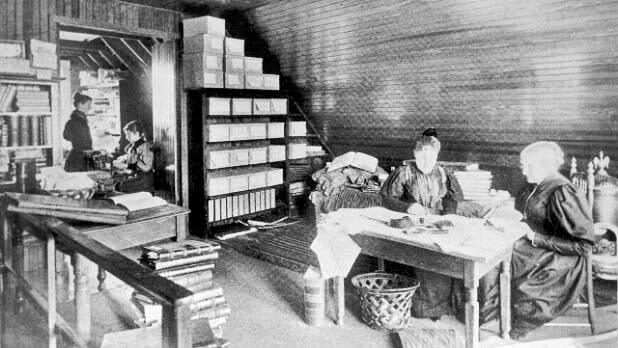 Most occupations were not available to women, particularly in fields such as medicine and law. The jobs that women could occupy paid only a small percentage of what men were paid. The very idea of a suffrage movement was inconceivable and seemed virtually impossible during this period of history. Anthony became a teacher (one of the few career options available to women) and was head of the girls department at Canajoharie Academy in Montgomery County. It was there that she discovered that male teachers received a salary of $10 per month and women received only $2.50 per month. This outraged Anthony and she attended the Rochester Woman’s Rights Convention with her mother and sisters to learn more about what was being done for women’s rights. This was also a time of tremendous division in the United States over the issue of slavery and Anthony’s family supported abolition. Her family moved to a farm in the Rochester area where they hosted meetings for abolitionists such as Frederick Douglass and William Lloyd Garrison. 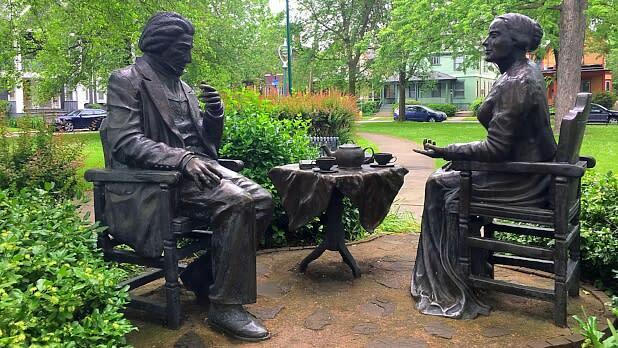 Anthony began her work as an activist by joining the Anti-Slavery Society and became friends with Frederick Douglass as they worked together in the abolitionist movement. 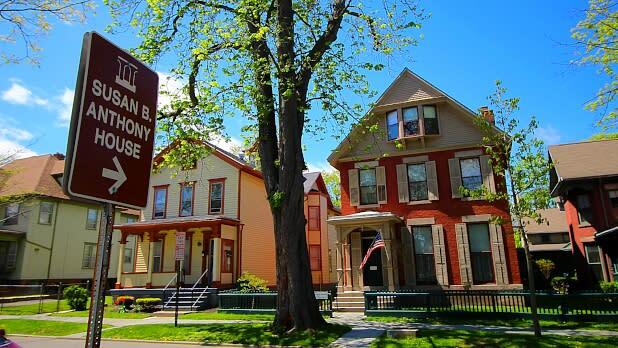 A few years later in Seneca Falls, women’s rights advocate Amelia Bloomer introduced Anthony to her future partner in the women’s suffrage movement, Elizabeth Cady Stanton. Her lifelong friendship with Stanton continued as they petitioned the New York State legislature to pass a law to limit alcohol sales. Their petition was rejected by the legislature because the majority of signatures were obtained from women and children. It was at that moment that Anthony realized that women’s concerns would never be taken seriously unless they could vote. 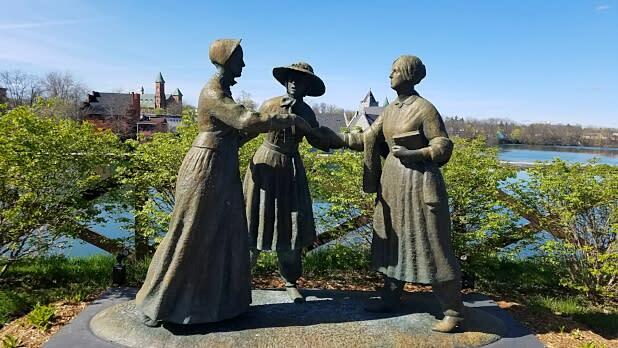 In 1852, she attended the Third National Women’s Rights Convention in Syracuse and after listening to the speech of suffragist Lucy Stone, Susan B. Anthony officially joined the women’s rights movement. Together, Anthony and Stanton began a weekly newspaper to promote women’s suffrage and equal rights. Published in Rochester and entitled, The Revolution, the motto was, “Men their rights, and nothing more; women their rights, and nothing less.” In addition to suffrage, the newspaper advocated for an eight-hour workday and equal pay, encouraging female workers to form their own working women’s associations, since they were excluded from labor unions. 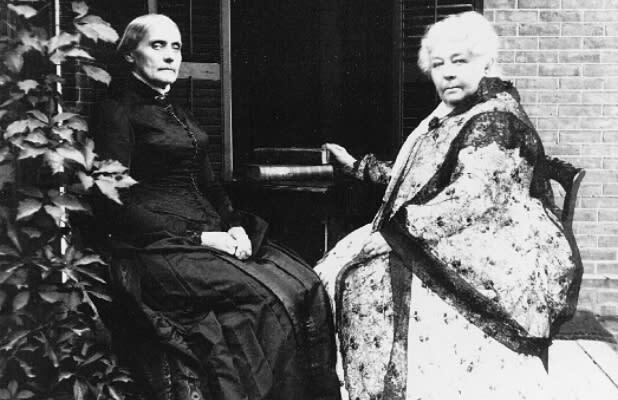 Anthony and Stanton also founded the National Woman Suffrage Association with the goal of a constitutional amendment that would ensure women the right to vote. Anthony, Stanton, and fellow suffragist Matilda Joslin Gage wrote and published the six volume, History of Women’s Suffrage which documents the journey of the women’s rights movement and their struggle for suffrage. Anthony’s passionate pursuit of equal rights brought her all over the country as she campaigned for the women’s right to vote and delivered hundreds of speeches a year, often in hostile and contentious environments. 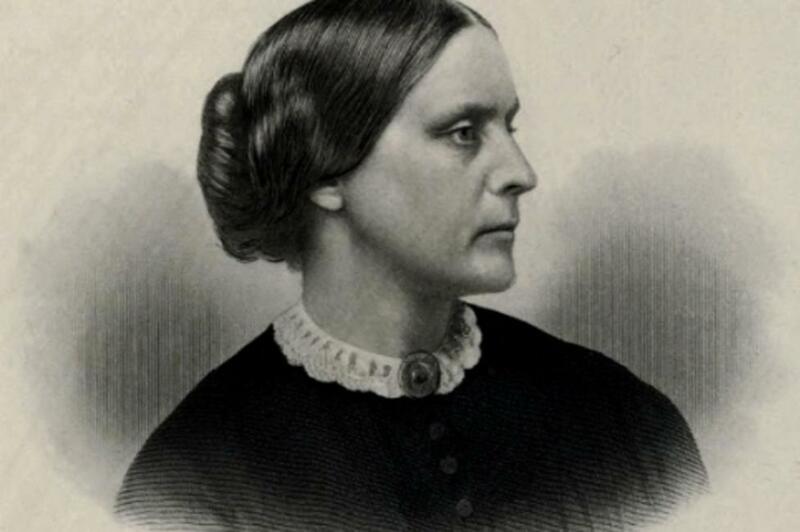 She refused to bend to the status quo and although it was still not legal for women to vote, Anthony cast her ballot in the 1872 election in Rochester. She was arrested in her living room for voting and fined $100, which she refused to pay. Although Anthony did not live to see women granted the right to vote, she never gave up the fight. She met with President Theodore Roosevelt at the age of 85 to lobby for suffrage. A year later, at her 86th birthday celebration Anthony gave her last speech, Failure is Impossible. She died shortly afterwards at her home in Rochester in 1906. According to her New York Times obituary, she told a friend, “To think I have had more than 60 years of hard struggle for a little liberty, and then to die without it seems so cruel." Eleven years later in 1917, New York State granted women the right to vote. Three years later, the 19th amendment to the U.S. Constitution was passed, finally allowing all women the right to vote in the United States. Share photos of your New York adventures on Instagram and Twitter with #ILoveNY and #iSpyNY and tag us on Facebook! Lisa is the Director of Tourism Marketing, Licensing and Public Relations of Empire State Development.